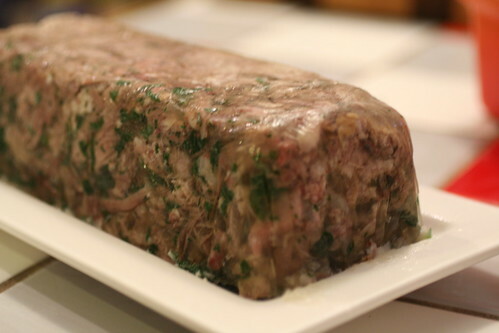 Brawn is a dish made from jellied pork. The head, and sometimes also the trotters, are used to make the dish. The meat is first cooked in brine before being removed and picked off the bone. The cooking liquid is then reduced until it begins to set with the gelatine released from the bones of the head and/or trotters. Finally, the meat is recombined with the reduced cooking liquid and set, usually in a loaf tin. Brawn often inspires divergent extremes of opinion. The revulsion that many feel at even the idea of jellied meat from the head of a pig has led to a gradual but steady decline in the dish’s popularity in the anglophone world, though, in common with many unfamiliar cuts of meat, it is experiencing something of a renaissance of late; it has also led to the dish being expressed at times as a form of culinary euphemism, coloured with red dye, for example, to conform to popular (though not always natural) ideas of what healthy meat ought to look like. It’s funny how people react to bone gelatin. When I make chicken stock, it is cooked until the liquid is reduced by 75%, and what is left is a gelatinous blob. The French consider this to be the mark of a well made stock, and it makes fabulously rich, tasty sauces that have a depth to them. Fantastic stuff. I always make up some stock and freeze it for soups etc. Adds flavour to everything.